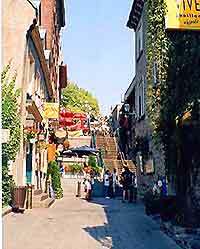 One of North America's most historical cities, Quebec City is a particularly attractive destination with numerous appealing places to visit. 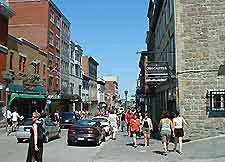 Many people choose to travel to Quebec City each year from all over Canada, America and throughout the world. Standing alongside the scenic St. Lawrence River, Quebec City is the country's second-biggest French-speaking city and much of city life is based around the region's rich French heritage. Featuring a mixture of high-rise structures, modern skyscrapers and historical buildings, Quebec City is home to the Parliament Building, which is known locally at the Assemblée Nationale and is an important center for political life in the area. With in excess of 300 languages spoken throughout America and Canada, English and French remain the main languages in Quebec City, and most highway signposts and tourist leaflets display both. Canadian English is widely spoken around Quebec City and is based upon British English, featuring many distinctive expressions. 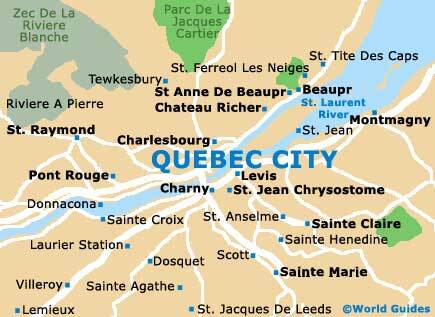 Canadian French is the main language in Quebec City and also throughout the provinces of Quebec and Manitoba. 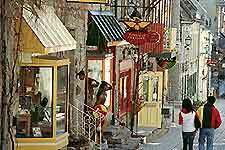 The French culture is very much embraced in Quebec City and more than 90% of residents claim to have French ancestors. Most people in the city are either bilingual or know basic English. Paper notes in Quebec City consist of $5, $10 and $20 notes, which are used every day as local currency, with higher notes such as $50 and $100 dollar bills being used less frequently. Tourists visiting Quebec City are able to use their credit and debit cards at ATMs, which are plentiful, offering a popular and convenient way to exchange currency. Also, travel agent companies in Quebec City, such as American Express and Thomas Cook, provide competitive rates of exchange, together with local banks. Most banks in Quebec City open Monday to Friday, although their opening hours are slightly shorter than regular stores in the Quebec City area. A number of banking branches in central Quebec City also now open during the evenings and on Saturday mornings. Visitors to Quebec City and other cities all over Canada require photo identification together with a minimum of two or three types of formal ID. Passports are always a necessity when arriving at Quebec City, except for those traveling directly from the USA and Greenland. A driver's license is no longer sufficient identification for US citizens arriving in Quebec City and should be used with a valid birth certificate or similar, such as an official certificate of citizenship. People visiting Quebec City from Commonwealth and Western countries do not require visas, although those visiting from most other countries do, except for Mexico. Visa applications prior to arrival in Quebec City and throughout Canada need to be made at least one month before travel. All inquiries should be directed to Canadian Immigration Centers. Motorists who wish to drive in the city of Quebec City must obtain a 'Canadian Nonresident Interprovince Motor Vehicle Liability Insurance Card' or 'Visitor to Canada Insurance', which most US insurance companies are able to issue. The majority of car rental agencies in Quebec City require you to be at least 21 years of age when renting a car, although for some this is 26 years. In Quebec City, the province of Quebec and all over Canada, cars always drive on the right-hand side of the road. Tipping in Quebec City is commonplace and many restaurants look to receive around 10% to 15% of the overall bill as a tip, although a number of restaurants automatically include service charges on the bill. Taxi drivers, barbers, hairdressers and hotel staff in Quebec City also expect to be tipped. All over Canada you are only able to purchase alcohol at local government-run stores, although in the provinces of Alberta and Quebec, including Quebec City, many privately owned stores are permitted to sell a range of alcohol. The current legal drinking age throughout the country is 19 years old, with the exception of Alberta and Manitoba, where the age is only 18. Smoking is now no longer allowed at many places in Quebec City, including public transportation options and restaurants.